 An in-depth look at a little-known American religious radical. Kenny (The Passion of Ansel Bourne, not reviewed) limns the life and legacy of Elias Smith (1769-1846), a Christian reformer in whom the author became interested while researching a volume on early cases of multiple personality disorder. (The polarities between personalities, he found, often have a religious element.) Smith was the leader of a loose network of reformist radicals who called themselves simply ``Christians.'' While serving as the pastor of an orthodox Baptist Church in Woburn, Mass., Smith became enamored of radical Jeffersonianism and determined to apply its democratic principles to Christianity. In the wake of the French Revolution (itself inspired by America's example), he called for a church free of authoritarian hierarchies and unshackled from centuries of ossified tradition. The Bible, still a principal source of authority for Smith, would be interpreted by ordinary laypeople for themselves without mediation by clergy. Smith's brand of Christianity was strongly premillenarian--looking toward the Second Coming of Christ, which would usher in 1,000 years of the Kingdom of God. In this, the United States had a special messianic role to fulfill; it was called by Providence to be an example to the world in helping to hasten the day. Through his newspaper, The Herald of Gospel Liberty (the first religious newspaper in the US), the New England divine became one of the most important religious figures of his day. 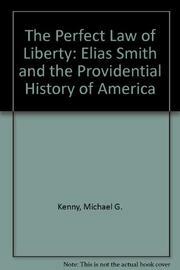 Kenny considers Smith as an example of the radical reconstruction of self through religious rebirth, and of the tensions in early America between concepts of individual liberty and the needs of society. Kenny provides a well-researched and readable biography of a man who helped democratize religion and in the process created a truly American Christianity.